So here are some better ways to handle conditionals. If you see the code we have to check whether each array element color is red or not. So we did the loop on each element and added the flag to check whether its true or not, but the code is so long, we can reduce it using Array.every() function. Much easier and cleaner right? 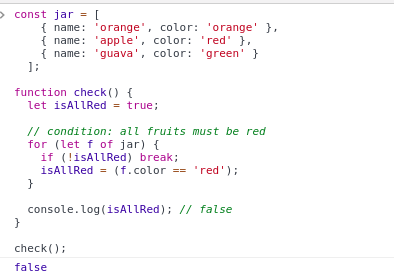 Now, let's take above example, you have to check whether jar contains red color or not so you can easily write that condition with the following code. if you want to check multiple conditions like if the fruit is apple or banana etc then we use the following statements to check. if you see the code you are checking with apple and banana only what if you have to add more fruits to check then again you have to add more || operator right? So let's use Array.includes to handle this condition. isn't it easy and maintainable? We can extract the element from an array. Thanks and comment if you want to some clarifications.